Tutu helper is one of the fasted growing apps to download tweaked, cracked, and modified apps on iOS 11 for iPhone, iPad, and all Android devices and PC. Tutu helper popular called Tutuapp is an app to download apps, games, wallpapers, themes, and other smartphone kits that cannot be found in Apple apps store and Google play store. The Tutu helper became celebrity app when people need to download Pokemon Go app for free which the Tutuapp was favored with a link to download series of hacked Pokemon Go game. If you are an ardent Pokemon Go player with Joystick. You need to take a look at the best way to fake GPS location on Pokemon Go game. However, if you have not been using the Tutue helper to download cracked and modified apps without jailbreaking your iOS this article is meant for you. Follow this post to the end and you will find a way to install the Tutu helper’s app on your iOS devices. Before we proceed to the deal of the day, it is good to know the features of the Tutuapp if you have not been using it before now. And even if you are an ardent user you will find a new thing to learn about the Tutuapp. Note: Do not click on the VIP download button so that you will not be charged for using the app instead of the free regular version. Another thing to do after you have successfully installed the Tutuapp helper is to add the app as a trusted device on your iOS. Since you are going to be downloading and installing apps and games from a source different from Apple apps store, there is a need to tell your device system to install apps downloaded using the TutuHelper app. Once the app has been added you can start using the app to download and install paid apps, cracked, and modified apps without jailbreaking your iOS device. There is a huge difference between the regular and VIP version. If you can’t afford the $12.9/yr VIP charge the regular version is a good one. However, if you are a fan of costly games the VIP worth the service. For the record, below are the core difference between the regular and VIP Tutuapp. Revoke The regular version may be revoked or inactive by Apple any time. The VIP version stays active forever even your iOS updates. For some reasons, you may face difficulties installing apps or games downloaded from Tutu helper. This often occurs once an app or game’s certificate has been revoked by Apple Inc. However, the only way to solve the download error message is to contact Tutuapp admin on Twitter via their handle, @Tutu_helper, state the error message and wait for their response. It may take a while, but, you will be told what to do next even if the app is no longer available. Finally, we are at the final stage we all been waiting for which is how to download and install games and apps from Tutuapp. To download games like Pokemon Go on Tutuapp follow these steps. Repeat these procedures for all apps you want to download from Tutuapp and install them on your iOS 11 device. Tutuapp has a .apk app for Android phone to download paid apps for free without rooting and registration. However, if you own an Android phone you can also install the Tutu helper for Android. First, you need to enable install from unknown sources in your Android settings. To enable install from unknown sources on your Android follow these procedures. Note that this procedure works for most Android devices. After you have followed the procedures above duly, we can then proceed to install the Tutu helper for Android. These procedures show the exact way to download and install Tutu helper for Android without rooting. 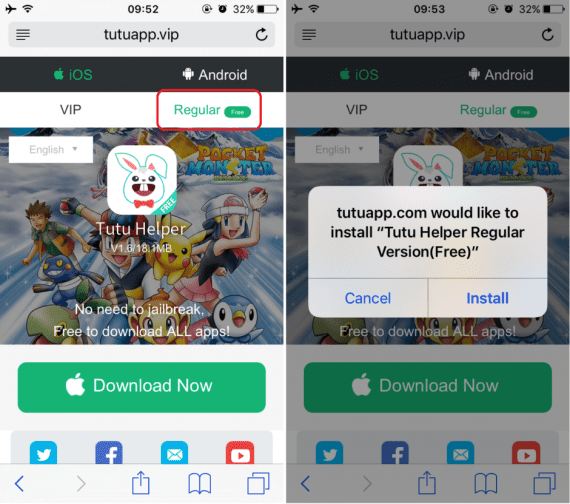 To start downloading and installing apps using the Tutu helper launch the app, search for the game or app to download and click on the download button beside it. Download and install.